It was a multicultural crowd that gathered in Rome’s Plaza San Silvestro to oppose the draconian Security Decree then pending in the Italian parliament. Popularly called the Salvini Law after Italy’s far-right Interior Minister, Matteo Salvini, the Decree was aimed at two broadly overlapping groups: immigrants and squatters. It displayed painted images of a mighty mountain and an old industrial building. Flying above the banner was the flag of the Kurdish revolutionary movement in Turkey and Syria. 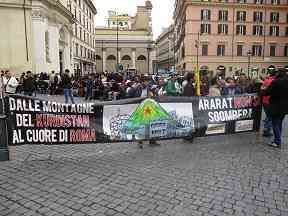 Ararat is the famous mountain in Turkey’s Kurdish east, but here it also refers to the Ararat Kurdish Cultural Center, one of Rome’s many squatted community centers, in a reclaimed industrial space in the city’s outlying Testaccio district. There was another contingent at the protest of Peruvian migrants living in a squatted building, and yet another from various Horn of Africa countries. The contingents clustered in groups, while the riot police and paramilitary Carabinieri formed a ring around the perimeter of the plaza. The Salvini Law, in addition to restricting the rights of migrants and refugees to asylum and government aid, imposes a five-year prison term for squatting. It was passed November 29, 2018, just six days after the protest in Plaza San Silvestro. Italy’s thousands of squatters—many of them displaced from their homelands in the Middle East, Africa and South America—are now in a precarious position. The first mass evictions under the law sparked street-fighting in Turin on February 10 after police raided El Asilo (The Asylum), a squatted community center. Rome’s San Lorenzo neighborhood, just east of the historic center, may be next to feel the heat. This area of mixed decaying apartment buildings and abandoned light industry, has the city’s highest density of occupazioni, as squats are called. They are mostly community centers in reclaimed abandoned properties—generally dubbed CSOAs, for centros sociales ocupatos auto-gestitos (self-managed occupied social centers). Communia is a self-described spacio de mutuo soccorso (space of mutual aid) on the edge of San Lorenzo. A banner above the entrance reads OMNIA SUNT COMMUNIA—Latin for “The Commons is All,” the slogan of Thomas Muntzer, the radical theologian who became a rebel leader during the German Peasants’ War of 1524-5. Pass through the gate, and a big mural portrait of the revolutionary cleric adorns the wall across the courtyard. Ylena, one of the volunteers at Communia, sees the area’s occupazioni as threatened by economic forces apart from the Salvini Law—along with the neighborhood’s traditional commons. As San Lorenzo is gentrified, “public streets are being closed by private developers,” she says. The struggle for control of space was dealt a propaganda blow in October with the death of Desiree Mariottini, 16, who was apparently given drugs before being sexually abused in a derelict building in San Lorenzo, and suffered an overdose. Three migrants from Senegal and Nigeria were arrested in the case, and Salvini visited San Lorenzo to rail against the “worms” infesting the district. Communia has moved through various locations since its founding in 2013, before settling into its current complex of disused warehouses. It now hosts a café, library, art gallery, and a sartoria migrante—a workshop where West African migrants make whimsical fashion items from recycled materials for sale in local markets. It is called Karalo Roma, from the word for “tailor” in the Mandinka language. Space is also provided for a group that offers legal counseling for migrants. Communia is hoping to gain legal rights to occupancy of the space which is still owned by the proprietors who abandoned it. Even amid the threats of repression and gentrification, there is a palpable sense of ferment in San Lorenzo. Among the numerous CSOAs is a palestra populare, or popular gymnasium where local rads can stay in shape for street actions. Radio Onda Rossa (Red Wave), a pirate station rooted in the Autonomist movement of the 1970s, has been on the air for almost 40 years. And, in a narrow storefront on Via dei Campani, near ancient walls dating to Rome’s imperial era, is the Anomalia anarchist bookstore. Founded in 1984, its lower level houses the archives of Errico Malatesta’s Italian Anarchist Federation, dating back to the 1940s. One of the slogans seen on banners at the rally in Plaza San Silvestro was SPEGNI LA MICCIA—”douse the fuse,” with the implication that the Salvini Law would put the country on a countdown to social explosion. Now that it has passed, the challenge facing Italy’s squatters is greater than ever. Bill Weinberg lives in New York City and blogs at CounterVortex.org.